Julio Vargas hoped to turn pro out of high school in 1989 and his coach Bill Ross assessed his chances to The Los Angeles Times. Ross included in his assessment injuries Vargas suffered playing football the previous fall, The Times wrote. "He's had some trouble with his elbow and I'm sure the scouts are a bit suspect of his arm," Ross told The Times. "But there are games where he just dominates. He picked off two runners against Villa Park and tagged out two runners at home against Foothill." Scouts for the Phillies thought high enough of Vargas to take him in the fourth round of that year's draft out of Santa Ana High. Vargas signed and started his pro career, but his career ended up being brief. He played three seasons. He briefly made high-A. At Santa Ana, Vargas hit two home runs in a April 1987 game. He won league player of the year honors in 1988. Vargas started with the Phillies at rookie Martinsville. The catcher got into 30 games and hit .270. He then moved to rookie Princeton for 1990. He hit .244 that year over 43 appearances. He moved a runner over on an infield hit in a July game. 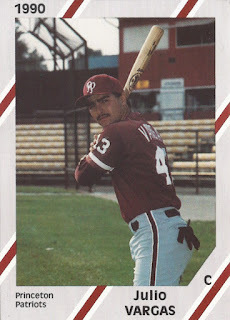 Vargas saw short-season Batavia and high-A Clearwater in 1991. He got into four games at Clearwater and 34 at Batavia. He hit .193 on the year, ending his career.